You get some massive bonuses when you use MyBookie Bonus Code SPOOKY100. Why Bet Sports at MyBookie Sportsbook? 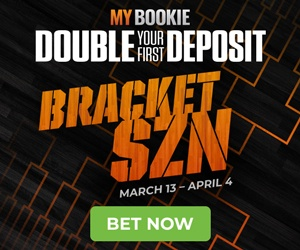 Already an industry leading online sports betting website, MyBookie strives to provide the main thing that most online gamblers are looking for, safety and security. It all starts with customer care for MyBookie, who realizes that in today’s world, the last thing that a sports bettor wants to worry about is the safety of his bankroll when he’s not placing bets. When it comes to expertise, MyBookie.ag provides it in droves. The organization has created one of the most well-respected sportsbooks in the industry with an easy to use interface, as well as mobile betting, that allows its members to wager on all of the major sporting events. The Racebook is just as easy to navigate as the sportsbook and offers straight win, place and show wagers as well as exotic bets on all of the major race tracks in North America. Casino players will have no problems placing wagers in the MyBookie.ag casino where BlackJack, Roulette and other casino games are offered. Spooky Express is always working on getting you the sportsbook promo codes for the sportsbooks we promote. When you use MyBookie Bonus Code Spooky100, you will be entitled to a 100% Sign up Bonus. Using MyBookie Promo Code SPOOKY100, you can get the following great sportsbook bonus. Up to $1,000 deposit – Minimum $100 deposit is required otherwise you will receive a 25% Bonus. There is a 5x-15x rollover required for this promotion. When you open a new account with SPOOKY100 promo code at MyBookie and place your first real-money wager you will receive a $20 refund if the wager is not graded as a winner. Refund is in the form of a free play and there is a 5x rollover. When you sign up for an account with SPOOKY100 promo code at MyBookie and fund your account up to $300 you will receive a 100% bonus up to $300. There is a 50x rollover play through on the deposit and bonus. Only with Spooky25 promo code – When you reload your existing account with a minimum of $100 you qualify for a 25% bonus and $25 Casino Chip. There is a 5-15x rollover. Enhance your horse racing action with a special 8% rebate for qualified tracks. You will receive 3% thru 8% rebate based on straight or exotic bets depending on bet and track. Many other additional Bonuses from Casino, MMA and Boxing to contests all month long at MyBookie. *See terms and conditions on website for all promotions. Some deposit methods do not qualify for bonuses. Now you can bet from anywhere, anytime with the all-new MyBookie mobile betting platform! Its fast, easy, and can be used anywhere from the office, watching the game on the couch or at the bar. Or you prefer to talk to a clerk on your phone you can call up and do so as well. MyBookie mobile betting platform offers many advantages and added benefits including hassle free interface, easy to navigate menus and access to the complete set of betting lines. Simply log into your account from your mobile phone and you can start betting your favorite sport right away. Live betting is one of the greatest wagering options available at many sportsbooks now. Log into your MyBookie account at anytime, anywhere from your desktop, smartphone or tablet and get started. You are actively wagering on an event while the play is going on. And don't forget to play at the World's best Live Online Casino as well. Prop betting is one of the more entertaining and unique forms of wagering on many sports. A prop bet, short for proposition bet, is essentially any wager that is not directly decided by the game's final outcome. Open a new account at MyBookie with SPOOKY100 promo code and fine one of the largest selections of props available from individual player props, team props, halftime lines, quarter lines and live wagering. Sending and receiving money from MyBookie is easier than most operations including Visa, MasterCard, Bank Wires. Person-2-Person Money Transfer and bitcoin. Cashier checks are available immediately upon receipt. You can get a payout as quick as within 48 hours.